Tired of boring chess sets? Take a walk on the wild side with stunning contemporary chess sets. While the vast majority of chess sets feature pieces that more or less conform to the traditional Staunton pattern, modern chess sets completely avoid it. You won’t see any horses and castles here, only smooth, geometrical shapes. Though some modern chess sets rely on the standard black and white checkered playing surface, many will put a new spin on that as well. Whether it’s incorporating new, bold colors or switching it up entirely, modern chess sets are rarely content to leave well enough alone. 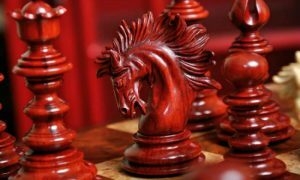 Modern chess sets are rarely wooden, and when they are, it’s used as a base material and covered with glossy lacquer to make it unrecognizable. You’ll often see modern chess sets that are plastic, glass, metal, or stone, and this style of chess set is where we see the most open experimentation with new materials. This is an iconic chess set they may very well have sparked the trend toward more modern designs for chess sets. It was first designed all the way back in 1920 by the famous Surrealist artist Man Ray. This particular set is a recreation of the original that was meticulously handcrafted by artisans in Germany, with a little help from an Italian violin maker to get the perfect scroll for the Knight pieces. 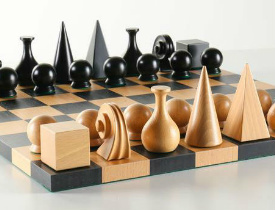 The whole Man Ray Chess Set is made from beechwood that has been either lacquered or veneered. 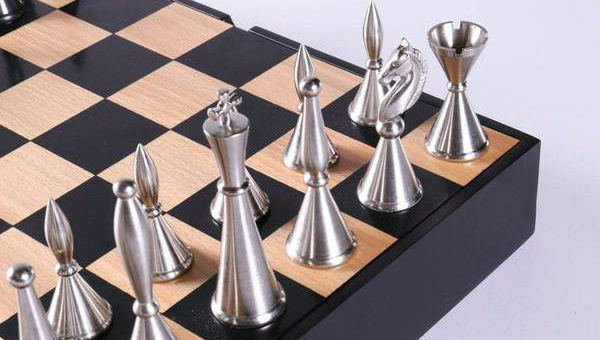 The modern chess pieces are undoubtedly the most striking part of this contemporary chess set. They are like nothing the world had ever seen before, but somehow the artist was still able to keep enough of each piece’s essence to make it easy to tell which is which. The pyramid shape represents the King, just as Egyptian pyramids were associated with Pharaohs and other rulers. The Queen features a smooth cone shape, which suggests the headgear of a medieval monarch. The Bishops are a flask like shape, which is a nod to their historical role as apothecaries and distillers. The pieces also each have a visual weight that is similar to their importance on the board. The pawns, for example, are short and squat, almost beneath notice. The Rooks don’t command much more attention, while the King and Queen pieces tower above the rest of the board. This design element makes it easy to tell at a glance which pieces are most powerful and important. The Australia Diaxi Modern Chess Set is really something special. Its materials and workmanship both exude luxury. It has a unique mixed material design featuring stainless steel, wood, brass, and leather all in perfect harmony with each other. 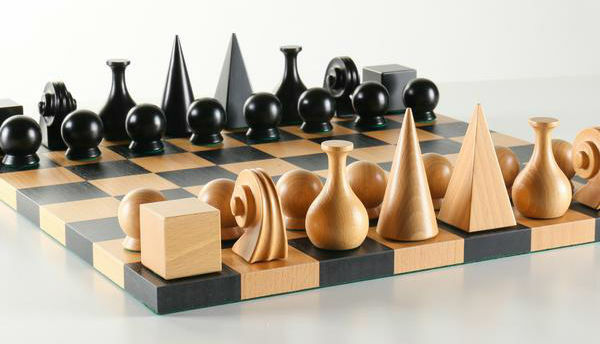 It’s an unlikely combination, but for this contemporary chess set, it works. 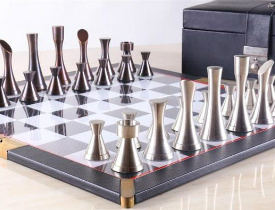 The modern chess pieces of The Australia Diaxi Chess Set are made from a sturdy aluminum composite frame with a brass or stainless steel overlay. Black graphite and d accents bring an extra element to each of the pieces. The set includes 32 chess pieces with green felt bases that are perfectly weighty. All together, the chessmen weigh a total of 53 ounces! The chess board is 16 ½ inches square during play, but folds down to a compact 16 ½ by 8 ¼ for storage. To do this, it utilizes a custom designed Diaxi hinge that can be locked during play and is completely unobtrusive. While you’re playing, you will never even notice it at all. It blends in and looks just like a decorative part of the board. When it’s time to put the board away, however, the hand operated hinge springs into action with its 90 degree movement restrictions! Brass detailing on each of the four corners help to disguise the hinge as well as offering additional protection for the playing surface while folded. This set also comes with a luxurious leather storage box with a green felt lining and two separate compartments in which to store your unique modern chess pieces. While there are many Art Deco style chess sets on the market, especially in the metal chess set category, we think this one is the best. Not only is it extremely beautiful, but it’s also quite functional with its built in storage space and the durability of the pieces themselves. 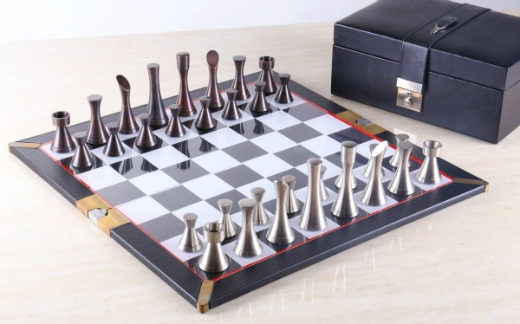 The chess pieces in The Modern Metal Art Deco Chessmen on Storage Chess set feature a sleek, tall and slim design with bronze and pewter finishes to provide contrast between the two armies. The King piece is 4 inches tall with a narrow base that’s 1.25 inches in diameter. The chess pieces are exquisite, but they’re not the star of the show when it comes to this contemporary chess set. That honor goes to the chessboard itself, which also doubles as a decorative and functional storage chest for the chess pieces. While you’re playing, the chest provides a spacious platform for your game at 16.25 inches square and 2.5 inches off the table. Not only is it extremely beautiful, but it’s also quite functional with its built in storage space. Inside the storage chess, there are wooden dividers that demarcate 32 separate slots, one for each piece. 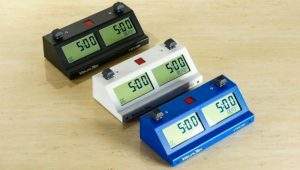 There are 16 spaces that measure 4.75″ x 1.75″ x 1.25″ and 16 slots measuring 2.50″ x 1.75″ x 1.25″. These custom sized slots help to ensure that each piece has is its own storage spot, and none of them are rolling around free and bumping into each other, potentially getting scratched or damaged. If you want, the chessboard can be lifted off of the storage chest and used or displayed alone. This modern chess set is a great piece for anyone who loves the Art Deco style paired with flawless functionality. 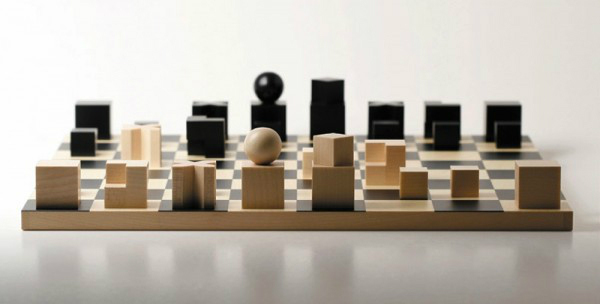 The Bauhaus Chess Set is a unique chess set designed to embody the Bauhaus style. It features simple, boxy pieces set against a borderless, high contrast chess board. Designed by Josef Hartwig in 1923, this set has a truly timeless look. The chessmen featured in The Bauhaus Chess Set are highly stripped down versions of the chess pieces that people are accustomed to seeing. They are chunky and low to the board, with many being just as wide as they are tall. The guiding idea behind the design was that chess pieces shouldn’t feature such an arbitrary design as they do according to the Staunton pattern – they should be formed in such a way that they give an indication of the way that they are each able to move. That’s what the artist strived for when designing this set. For example, the Bishop pieces, which move diagonally, are designed in the shape of a letter X. The Knight, who moves in an “L” shape, is made from two connected “L” shapes. This is a great concept for a chess set, and one that we think more designers should get behind. 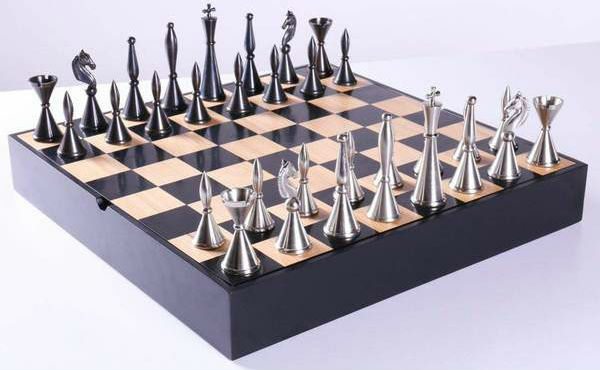 It’s also executed beautifully in this gorgeous, modern chess set. 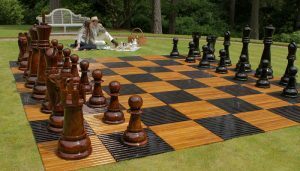 The chessboard is made from alternating squares of dark and light maple wood in shades that perfectly match the pieces. It’s familiar design grounds the whole set and ties it all together. The set is also complete with a matching wooden chess box that’s custom designed for these unique pieces. This set would be great for anyone who loves the modern look, or fans of the Bauhaus style. 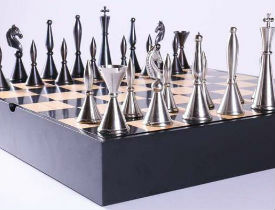 This modern chess set features a unique design for its pieces, which are all very smooth and streamlined. The intricate detailing of a traditional chess piece pattern is forgone in this set in favor of a sleek, contemporary design that is unlike anything we’ve ever seen before, even on other modern and contemporary chess sets. The Black Berliner Set is hand carved, and the simplicity of its design allows the makers to sell this high quality set for a very affordable price. You won’t pay a premium for this product, but you will certainly be impressed with the quality of product that you receive. This set offers a great amount of value for the money, and is perfect for buyers who want to get the best possible bang for their buck. The King pieces in this set are 3.88 inches tall with a 1.5 inch base. Each individual chess piece has a felt base pad on the bottom to protect your chess board against scratching and other damage during use. The whole set of chess pieces weighs only 37 ounces. 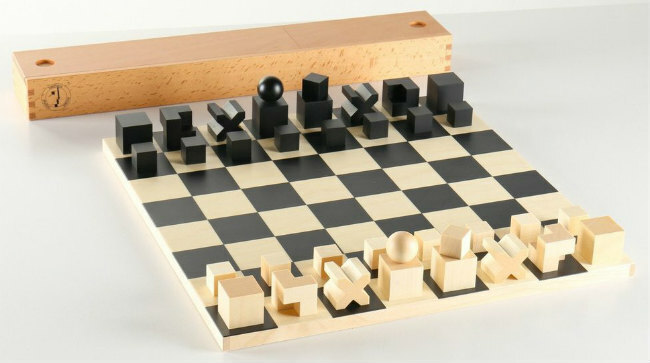 The Black Berliner on Black Basic Board comes with a basic chess board made from maple wood. It features a frameless design with 2 inch squares, which would make the board about 16 inches square. 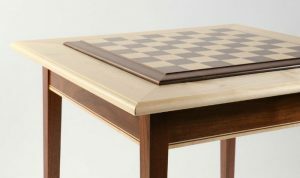 The edge to edge playing surface is a great contemporary design feature that blends perfectly with the rest of this modern chess set. The Black Berliner on Black Birdseye Board Set comes, of course, with a black Birdseye chessboard. This spacious board features generously sized 2.2 inch squares that give you plenty of space to spread out during a game. 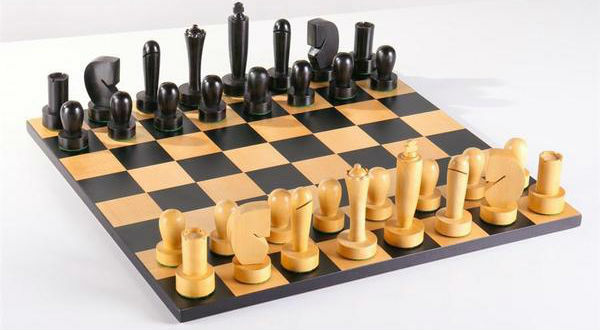 You’ll never feel crowded with this modern chess set! 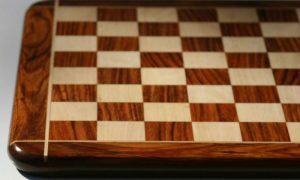 There is also an inlaid border and frame that goes around the outer edge of the board, bringing the total footprint of this chess board up to 20.5 inches square. What Makes a Modern Chess Set Modern? Now that you’ve seen a few of the best modern chess sets available, you should have a good indication of whether or not this style is for you. If you’re someone who has been bored by the limited variation between one traditional chess set and another, you may feel refreshed and excited by the avant garde designs of these contemporary chess sets. If, however, you’re someone who delights in the small differences in details between one Staunton pattern wooden chess set and another, these modern chess sets might seem like a bit too much for you. Either way is fine, we all have our own tastes. To close out this review, we’d just like to take some time to explore the features that make a modern chess set a modern chess set, as well as how they typically differ from traditional sets. The first, and usually the most noticeable, way that contemporary chess sets differ from more traditional ones is in the chess pieces. 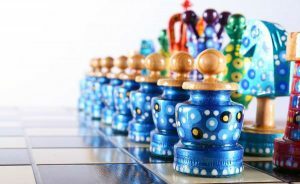 While traditional chessmen almost always take on the familiar shapes associated with Kings, Knights, Rooks, and Bishops with very little variation, modern chess sets reinvent the whole concept and redesign each piece individually. They might base their designs on the movements of each piece or its importance on the board, or they may just choose shapes that look nice together. Modern chess boards often incorporate new features that traditional boards are not equipped with. Rather than being simply a surface on which the game takes place, modern chess boards strive to push the envelope on what they can become, coming up with new bells and whistles like hidden hinges or stackable sections. 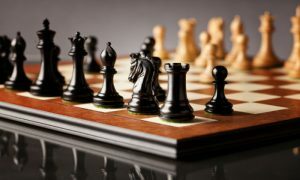 Many of the most striking modern chess sets available today are made of materials other than wood, which is most typical for traditional chess boards. In fact, a hallmark of modern chess board design is experimentation with different materials. We’ve seen modern chess boards made out of metal, glass, plastic, concrete, resin, and all manner of other things. They’re always experimenting with new materials, so you never know what they will come up with next!